Your Samsung Galaxy S5 has an Interaction Control feature that allows you to restrict some functions in your phone. This will come in handy when you allow other users limited access to your device. You can even use it as an additional security feature as it manipulates screen and hardkey functions as well. In this post, I will guide you through enabling and using the Interaction control feature. It will just be short and quick so browse through sections to know more about it. Interaction control will let you change the way you interact with your phone's settings and apps. It allows you to block areas of the screen to prevent the phone from interacting with touch commands. Once enabled, Interaction control automatically disables Auto rotate screen and the device won't respond to hardkey presses. To be able to use the Interaction Control feature, you need to enable it first. Don't worry, it's easy to turn it on and you don't need tricks to so. Tap Settings and then scroll to the Personalization section. Touch Accessibility and choose Dexterity and interaction. Tap the slider next to Interaction control to turn it on. The Interaction control feature is now enabled. 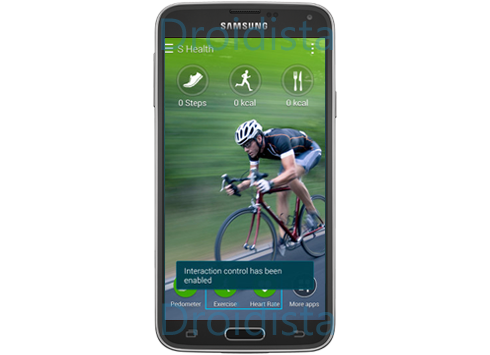 The Samsung Galaxy S5's Interaction control feature was designed to work seamlessly with apps. Therefore, if you want to use on an app, you need to launch the app first. Press and hold the Home button and Volume Down button simultaneously. An adjustable frame appears on the screen. Now draw a line around an area that you want to restrict; just tap and drag set points to do so. The restricted area is displayed. If you tap within that area, the phone won't respond. To disable Interaction control, press and hold the Home and Volume Down buttons simultaneously again. The Interaction control feature is yet another security feature, however, it works only for people who are not yet acquainted with the Samsung Galaxy S5. Nevertheless, the feature may be useful somehow. If you have more questions or problems about your Android phone, feel free to email me at harold@droidista.com.